The Senate’s lawyer doesn’t participate in important litigation against the executive anymore. Here’s why. Why did Mitch McConnell—not the Senate’s lawyer—participate in Monday’s recess appointments case at the Supreme Court? 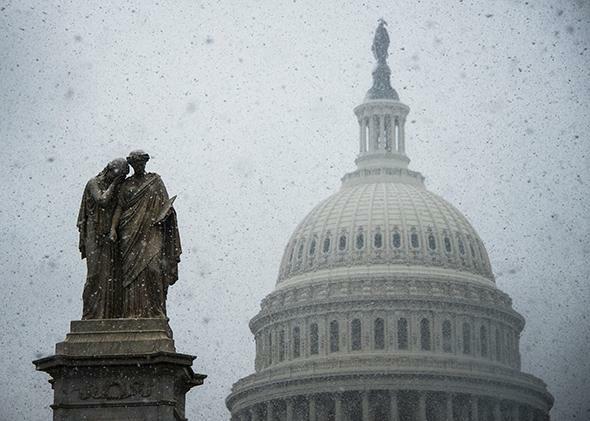 Snow falls on a statue outside the Capitol in Washington in 2013. At oral arguments Monday on President Obama’s recess appointment power, Senate Republicans locked horns with Obama’s Department of Justice. The Office of Senate Legal Counsel is not participating in the suit, even though it involves the Senate directly. Instead, the justices agreed to a request by Senate Minority Leader Mitch McConnell to participate in the oral argument. In Monday’s recess appointment case, why would the Senate’s own lawyer sit on his hands while the minority leader purports to speak for the Senate? And why were House Republicans Congress’s only voice in oral arguments in the DOMA case? The answer lies in the differences in the ways the House and Senate can participate in litigation—differences exacerbated by the polarization of Democrats and Republicans in both the House and Senate. The Office of Senate Legal Counsel can only participate in litigation with broad bipartisan support. By statute, counsel representation of the Senate requires two-thirds support of a leadership group made up of four members of the majority party and three members of the minority party. This supermajority requirement made perfect sense back when the office was created in 1978. Reflecting both Senate norms favoring bipartisanship and Senate desires to defend its institutional prerogatives in the wake of Watergate, the Office of Senate Legal Counsel was created to speak the Senate’s collective voice in disputes with the executive branch. Throughout the 1980s, the Office of Senate Legal Counsel defended the constitutionality of federal statutes in several high-profile disputes with the executive branch. In cases involving the constitutionality of the legislative veto, deficit-reduction legislation, independent counsel investigations of high-ranking executive officials, and race preferences in broadcasting, the Senate counsel defended Congress’ institutional prerogatives before the Supreme Court. In some of these cases, Republican Ronald Reagan was president, and the Senate majority was also Republican. In other words, 1980s Republicans were willing to stand up to a Republican president to advance the institutional interests of the Senate. The recess appointment appeal being heard Monday is precisely the type of case Congress had in mind when it created the Office of Senate Legal Counsel. The case concerns the president’s power to fill vacancies in the executive or judicial branches, when the Senate is “in recess”—and thus unable to hold a confirmation hearing. The president, not surprisingly, has a broad view of what constitutes a Senate recess—to curb restraints on his power to make recess appointments. In the abstract, the Senate would be expected to have a somewhat narrower view of what constitutes a recess—so as to expand its own role in confirmations. But in today’s polarized Congress, Democrats and Republicans did not come together to assert a shared institutional view of what might constitute a Senate recess. In particular, whereas Senate Republicans are eager to assert their institutional prerogatives against the president, Senate Democrats seem altogether unwilling to challenge Obama’s efforts to use recess appointments to get his nominees through the Senate. The inability of Senate Republicans and Democrats to come together is not completely new. Since the 1995 Republican takeover of Congress, the Senate counsel has not participated in a single case in which the Department of Justice has refused to defend a federal statute. Indeed, I am aware of no recent Senate–executive branch dispute in which the Senate counsel has gone to court to assert Senate prerogatives. Instead, reflecting ever-increasing party polarization in Congress, the Senate counsel has been absolutely unable to speak with a bipartisan voice in disputes with the executive. In a 1993 lawsuit over a recess appointment by then–lame duck President George H.W. Bush, minority party Senate Republicans blocked the filing of a brief that would have defended the Senate’s confirmation power. That the justices will hear only from the Senate minority and not from the Senate itself is truly unfortunate. The case, of course, has extremely serious implications for the balance of power between the president and Senate. Given the recent fights over the appointments process and the use of the nuclear option, the Supreme Court’s understanding of the real-world dynamic between the Senate and president on recess appointments might impact its final ruling in the case. The fact that the Supreme Court will hear only from the Senate minority could shape the court’s understanding of this dynamic. When it comes to the House, majority rules. The House counsel essentially works for the speaker of the House. The so-called Bipartisan Legal Advisory Group that authorizes House counsel action is largely a sham. In the DOMA case, for example, BLAG divided along strictly partisan lines to authorize House intervention in the case. Likewise, BLAG divided along partisan lines in 2000 when defending a federal statute overturning Miranda v. Arizona. Differences between today’s House and Senate are also revealed in the willingness for the House, but not the Senate, to go to court to assert its institutional prerogatives against the executive. With House rules allowing a simple majority to invoke both the contempt power and the filing of lawsuits by the House counsel, the House is likely to be a vigorous proponent for congressional prerogatives when the opposition party controls the White House. In an ongoing dispute between the House and Attorney General Eric Holder about the “Fast and Furious” gun-running operation, the Republican majority is seeking judicial enforcement of a subpoena against the attorney general. During the George W. Bush administration, Democrats were in the majority and similarly sought judicial enforcement of subpoenas in a 2007 dispute over the firing of U.S. attorneys. Party polarization and House-Senate differences are now a fact of life and, apparently, so is the strange spectacle of the Supreme Court hearing oral arguments from the House majority in the DOMA case and the Senate minority in the recess appointment case. Indeed, the bipartisanship requirement that now makes it impossible for the Senate counsel to participate in litigation that divides the parties is statutorily mandated, from a time when we could imagine a Senate that could sometimes agree. It is even more urgent, therefore, that the justices hearing the recess appointments case recognize that they are only hearing from the Senate minority —not the House, not the Senate, and certainly not the entire Congress.